Successfully Added Solar Battery Charger For Mobile Phones and Mini USB Devices to your Shopping Cart. Solar charger for your cellphones, camera, MP3 player and USB devices. 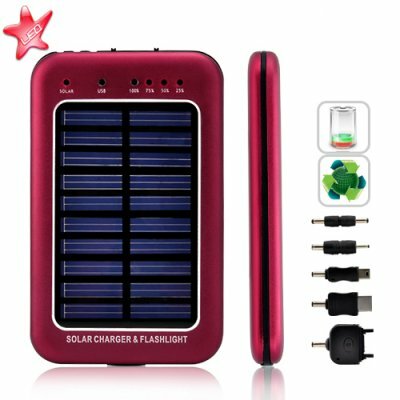 This attractive fuchsia colored portable solar charger contains a powerful 2600mAh battery that is perfect for charging your electronic devices on the go. This convenient device comes in a pocket sized form factor so you can comfortably bring it with you wherever you go. In addition, this specific model comes with 3 powerful white LED lights that work as an excellent flashlight in case of an emergency or power outage. The S13 solar battery charger even comes with multiple voltage settings so you can safely match the voltage of any device you wish to charge. Using the solar charger is fast and easy. Simply place the solar charger in sunlight to charge the internal battery, or charge it via USB or AC wall adapter. You are now ready to start charging your cell phone or Mini USB device if your battery happens to become low or even empty. This is truly a remarkable technology that is not only convenient, but environmentally friendly as well! 6 days delivery to New Zealand, great. Took the charger out of the box and it lite up and started charging straight away...i was inside too! So simple, they just work, I left one changed up, and left it around for two weeks and it is still fully charged. The other one, I left the torch on over night, and it was still going 10 hours later. I think anyone who has electronic devices that have ever gone flat should have one of these. I ordered six of these, had them sent via FedEx and a week later they showed up in Minnesota. I am an engineer and won't be using these on phones (although I did charge my Blackberry once just to see :) Instead, I'll be experimenting with them to power small wireless sensors out-of-doors. These sensors run about 6 to 7 months on 3 AA batteries (~4.5v) and no ability to recharge themselves. So it will be interesting to see if these solar+battery+charger units can be used instead of the existing AA, so feeding 4.5v directly into the sensor. This product is NOT water-proof, so I'll be putting them inside of a clear-top NEMA box - the box costing 3 times the price of this product!